While Ford and Ram were busy gloating about their latest pickup offerings at the 2012 Texas State Fair, General Motors kept its upcoming set of new Chevrolet and GMC pickups under wraps and testing up north, here in Michigan, as evident by these spy photos on Pickuptrucks.com. What we have here appears to be both the 2014 GMC Sierra 1500 and 3500 pickups, completely encased in black covering. However, it is easy to make out the front headlamps, which take a very dynamic and detailed approach to lighting the way forward. The front fascia, while still wrapped, seems to heavily resemble that of the GMC All Terrain HD concept — a behemoth of a truck that was displayed during the 2011 auto show season. 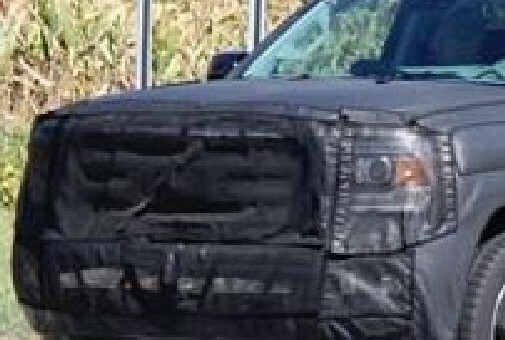 The front fascia of the dually also appears to have more ventallation, a tell-tale sign of enhanced cooling for the truck’s Duramax diesel engine. I’m hoping they’ll offer hid or LED headlights and LED taillights, sad to see that the frame is not tucked in on HD models. This trucks need to be ground breaking and GM shouldn’t focus on how to make huge profit, but instead atleast reclaim its market share by offering solid truck that would set a new bench mark by far. Is that projector beams that I saw? The more I see these trucks the more I ask myself: “What exactly are they trying to disguise?”. Companies only disguise something that we’ve never seen before and they want to hid from their competitors. But now that I think about it they’re actually hiding the trucks from us! If they let us see what is going on under there we might very well rush out and get a Ford or a Ram instead! Okay…maybe not…but can they afford to take the risk? LOL! Maybe they’re doing it so people won’t wait for these new trucks (somebody gotta buy current trucks). I hope they’ll come out with new up to date towing mirrors on production version. The headlights look pretty cool in these photos, but they almost look a little too busy for a “tough” truck. They also look a little lost nest to that massive grille, at least in these photos, which, coincidentally, appeared as Ford and Ram were introducing their latest trucks. i would like to see the crew cab have more room in the rear seats. i have been a GM man for over 20 years and love the product, but dodge megacab and ford have so much more room.